Just two days after it debuted, the Liberals have yanked a French-language ad off the air had to edit a French language ad to remove an embarrassing image. 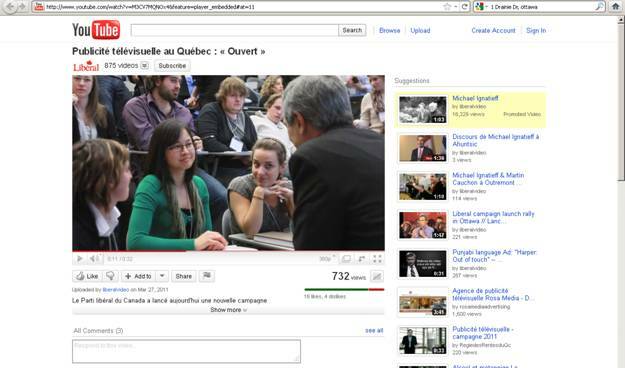 The TV spot contained a still photo of leader Michael Ignatieff talking to what appears to be a group of students. Unbeknownst to the Liberals, the young woman in the green sweater at the centre of the frame is Anne Minh Thu Quach, who ran for the NDP in 2008 in the Quebec riding of Beauharnois-Salaberry. “I’m easy to recognize: I am an Asian wearing a green sweater,” she wrote to the Liberals, asking them to take the ad down. Ms. Thu Quach saw herself in the ad while watching the insanely popular Tout le monde en parle on Radio-Canada on Sunday night. She said she is still an NDP supporter. As previously discussed on this blog, the same ad included images presented as typical Canadians that were actually stock photos purchased online, one from Alberta and another of an elderly woman from the United Kingdom.